Imagine a house built and tailored to your every need and personal taste. Hugh Howard dreamed of such a house, and when he and his wife, Betsy, learn that they're expecting their second child, he seizes the opportunity to build a home for their growing family. Fifteen months later and just in time for the winter holidays, Howard, exhausted and wildly over his budget, completes their home-a fine 2,500-square-foot Federal-style house. And each piece has a story, from the cut nails that come from Howard's old elementary school janitor to the staircase that comes from a parsonage built just after the Civil War. Howard discovers that all his planning and hard work earn him a house, yes, but he also gains a community of new friends-the people who help him along the way. There's Charlie, whose ancestors helped establish the upstate New York hamlet where they build the house; Ralph, a third-generation mason, who constructs a remarkable Russian heater; and Robbie, an eccentric Irish landscaper who has his own peculiar way of designing a garden. 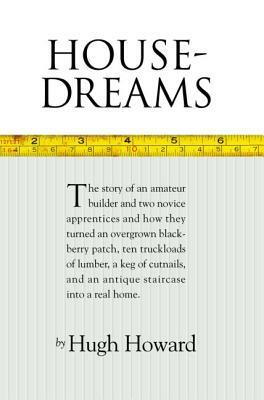 HOUSE-DREAMS is for readers who spend weekends improving their houses, hardware store die-hards, and the millions who regularly tune in to the Home Garden Network and PBS's This Old House.